I don't believe in the Quantified Self fad but I do believe in tracking how far I go bicycling. 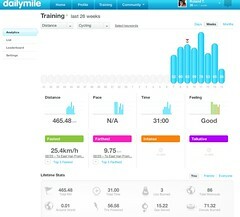 And the Cyclemeter iPhone App / Daily Mile social "workout" community does a great job as you can see in the screenshot above. I have turned off the CycleMeter feature which tells you if you are are "worse" or "better" than median or average because I don't believe in "racing" especially when commuting to work by bicycling; better to enjoy your bike ride rather than yak shaving about a few seconds here and there. Sure would be nice if there was a standard to share data among bicycling tracking apps so I could see all of my bicycling which is spread across Sports Tracker (700+ "workouts"), RunKeeper (176 "workouts") and now Cyclemeter (86 "workouts").